ABCDchicago: DHOOM - Diwali 2013 Bash! DHOOM - Diwali 2013 Bash! 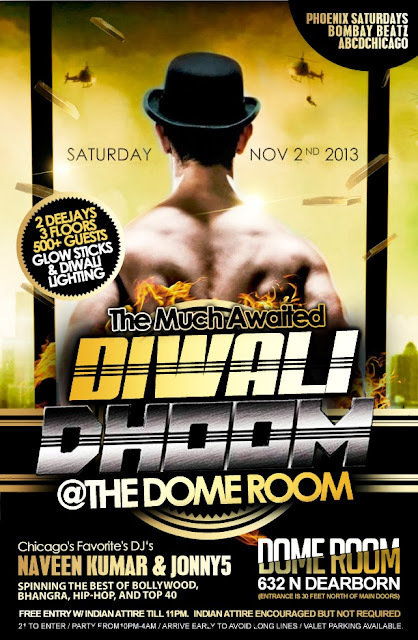 Join us for the most anticipated PARTY OF THE YEAR - DHOOM 2013!!!! Come celebrate the 'festival of lights' at Chicago's biggest DIWALI bash at the hottest nightclub in town - Dome Room inside Castle Chicago! Top 40, Hip-Hop, House, Bhangra, & Bollywoood! Click here to RSVP for Comp Entry till 11p or wearing Indian Attire. List closes 8pm. Call 773-490-0975 book groups, tables, and to host charitable events. Entrance is 30 feet north of main Castle door. Do not wait in the Castle line on Ontario. Indian attire. No sneakers, no t-shirts. 21 to enter with US Government-issued ID. Valet parking for $15.